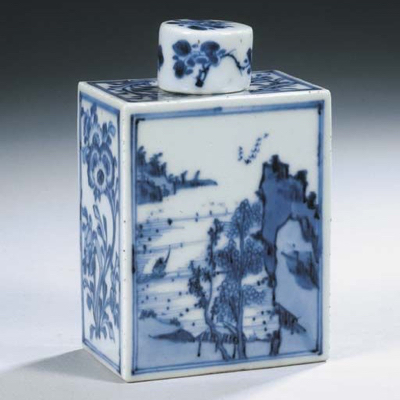 This porcelain tea canister is simply stunning. 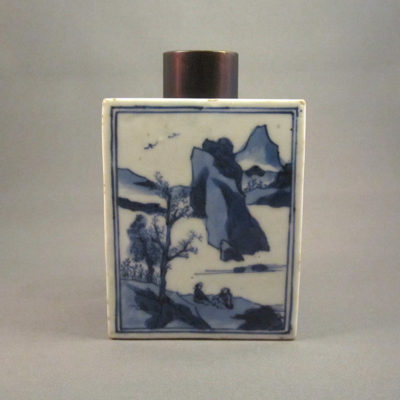 It was made in China during the Kangxi period (1662-1722) and is decorated with blue underglaze enamel depicting mountainous landscapes on both sides. 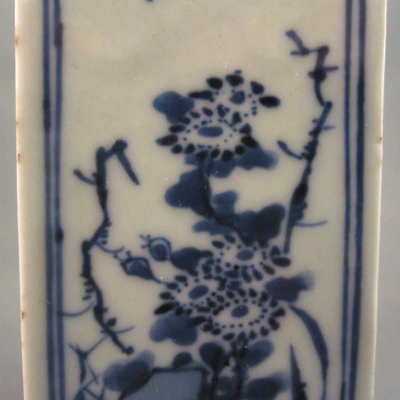 The ends are painted with flowers among jagged rocks. 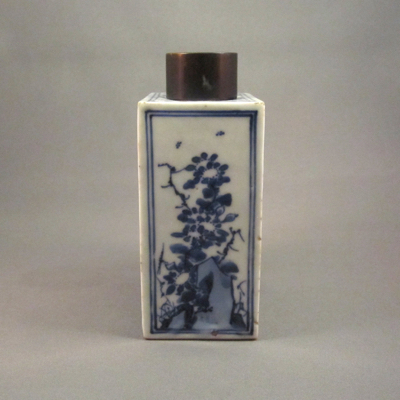 It measures 4.75 inches high, 3 inches wide, 2 inches deep. 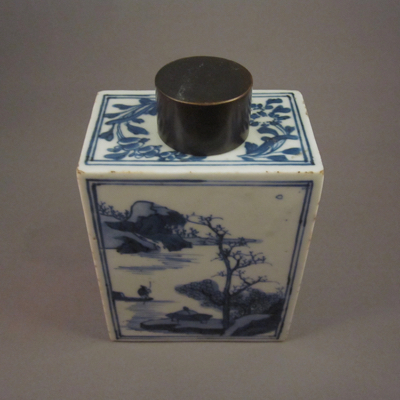 It is unusual to find tea canisters with their original lids so I am not surprised that this one has a metal replacement. 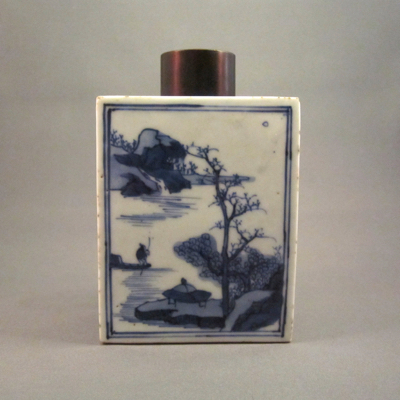 Then again, if it had its original lid I would not have bought it! 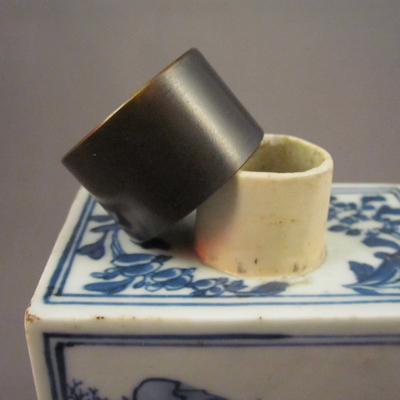 Having seen dozens of tea canisters with replacement lids made from various materials including silver, tin, and wood, I find this simple cylindrical bronze replacement the perfect topper. 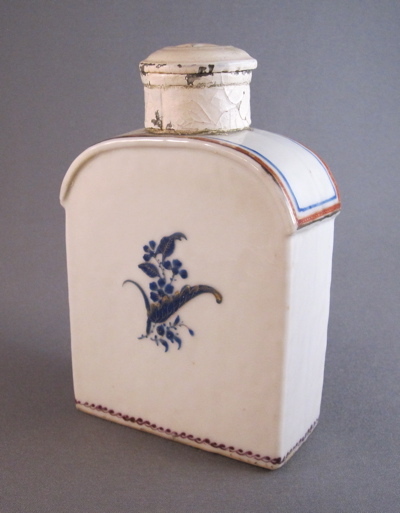 This tea canister with similar form and decorations shows what the original lid might have looked like on mine. 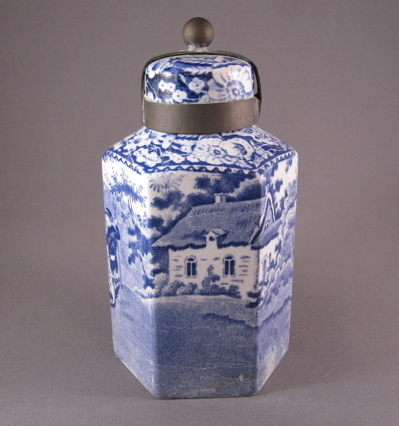 English porcelain tea caddy with blue and white transfer decoration, made by F & R Pratt and Company of Fenton, Staffordshire from 1880 to 1920. 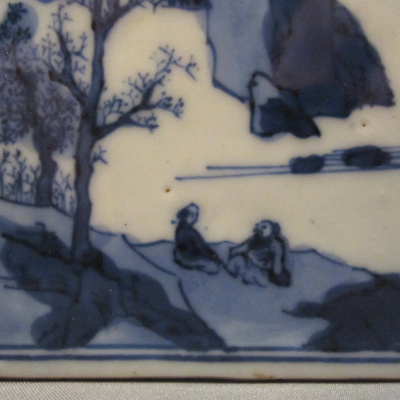 The scene is believed to depict Lady Eleanor Butler and Miss Sarah Ponsonby known as “The Ladies of Llangollen” who lived together in North Wales from 1790 to 1831. 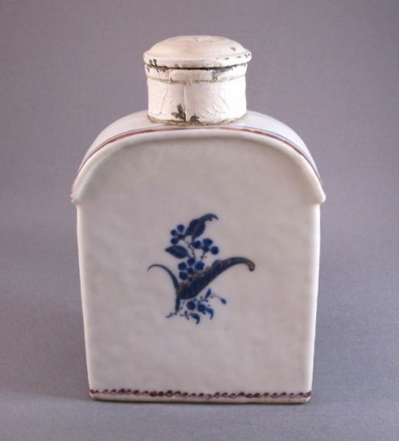 Tea caddy measures 5-3/4″ high. 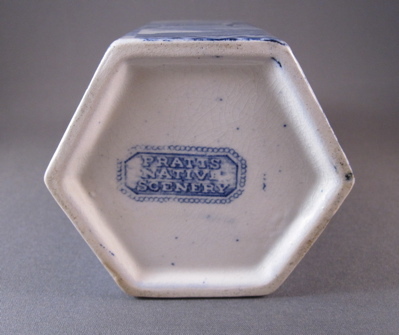 Marked in blue transfer on the bottom “Pratts Native Scenery”. 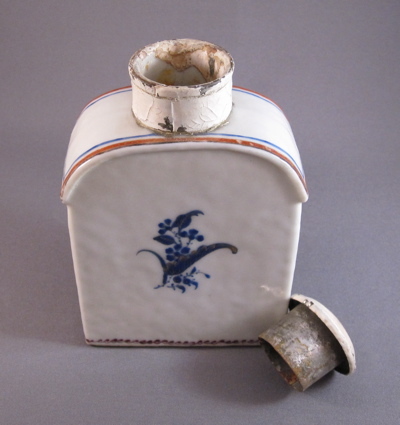 Clever copper strap repair holds together the two broken halves of the lid. 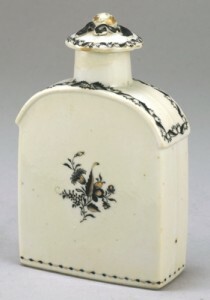 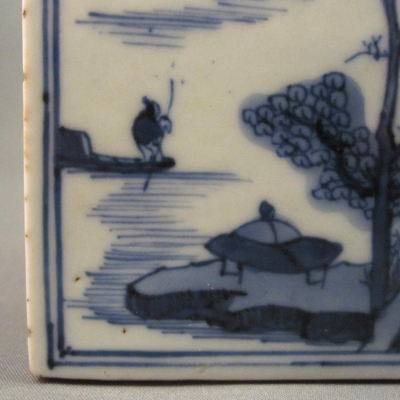 A porcelain tea caddy with sloped shoulders and rectangular body, made in China in the third quarter of the 1700s for export to North America and Europe. 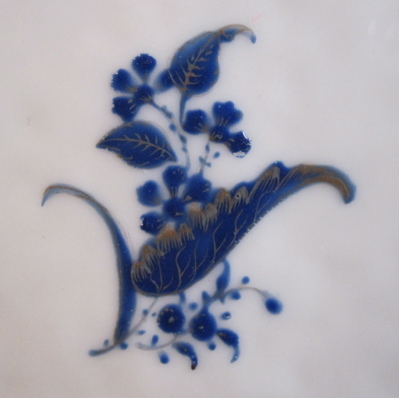 The hand painted cobalt blue decoration with gilt highlights is in the “Jesuit” floral pattern. 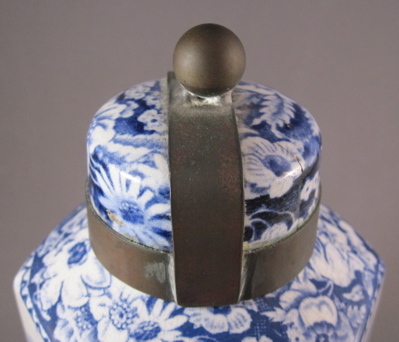 A painted metal lid with embossed star & collar replaces the original floriform finial lid. 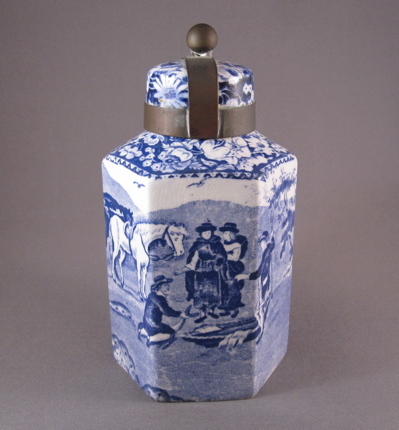 Tea caddy dates from the Qianlong period (1736-95) and measures 5″ high by 3-1/4″ wide. This intact tea caddy with similar form and decoration still maintains its original floriform finial lid.